Girls are girls wherever they live—and the Sisters in Time series shows that girls are girls whenever they lived, too! This new collection brings together four historical fiction books for 8–12-year-old girls: Lydia the Patriot: The Boston Massacre (covering the year 1770), Kate and the Spies: The American Revolution (1775), Betsy’s River Adventure: The Journey Westward (1808), and Grace and the Bully: Drought on the Frontier (1819), American Challenge will transport readers back to the formative years of our nation, teaching important lessons of history and Christian faith. 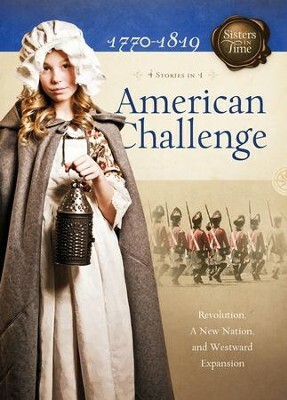 Featuring bonus educational materials such as time lines and brief biographies of key historical figures, American Challenge is ideal for anytime reading and an excellent resource for home schooling. Susan Martins Miller has been writing and shaping books for more than twenty years. She has nearly sixty books to her credit in various genres, including titles for both children and adults, and books to enjoy at home or use in church ministry. Colorado Springs is home, where she lives with her husband and two young adult children. I'm the author/artist and I want to review American Challenge: Revolution, A New Nation, and Westward Expansion - eBook.